LinkedIn's new Recruiter mobile app. Hiring managers are busy bees who sometimes have to close a deal from their mobile phones, which is apparently what led LinkedIn to offer a mobile app for recruiters on the go. The social network Wednesday launched LinkedIn Recruiter, a mobile version of many of the recruiter tools the company offers on the desktop. LinkedIn's Recruiter site already provides tools such as targeted candidate search, direct messaging and organizational features for recruiters and hiring managers, for a fee. But more people are migrating away from the desktop in favor of smartphones and tablets -- even when they're job hunting -- and LinkedIn wants to provide a mobile-focused service for the recruiters on the other end. About 33 percent of the site's 230 million-plus members visit LinkedIn from mobile devices, the company said. Also, more than 30 percent of LinkedIn job views are from mobile devices and half of the people who have applied via mobile for jobs never applied from the desktop, according to the company. 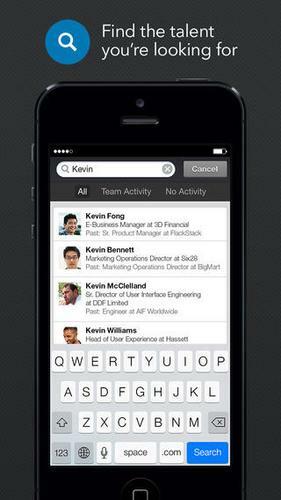 LinkedIn's new app is based on the premise that recruiters are just as attached to their mobile devices as job seekers. The app, therefore, is designed to help them stay on top of the hiring process when they're out and about. The app springs from a several-months-long process among the company's mobile designers, a company representative said Wednesday during LinkedIn's Talent Connect event in Las Vegas. The app is free for people who already have a Recruiter account. It is available for the iPhone in Apple's App Store, and a mobile Web version is available at www.linkedin.com/recruiter. With the app, recruiters can track updates on job openings to see who has applied for certain positions, attach hiring manager reviews to candidates and place prospective hires into organizational folders, among other things. Like the desktop site, the app also includes direct messaging, so hiring managers can, say, call a candidate to set up an interview. LinkedIn, the social network for working professionals, job seekers and now teenagers, announced another mobile feature Wednesday: Work With Us. The tool is designed to let hiring managers showcase job openings within employees' profiles on the site. One of the most popular things to do on the site is look at other people's profiles, the company said. This feature, therefore, could make it easier for people to discover jobs and take an interest in them, if they are linked to the profile of someone they already know.